In Bali a couple can live like royalty in most towns for $2,500. If you choose to live right by the beach in a three-bedroom villa with a pool, it’s sure to stretch your budget. Forgo the pool and you could save yourself a few hundred dollars…but it is a good thing to have since the weather is hot and humid all year long. Eating meals out can cost you just a few dollars, especially if you eat out at the local warungs, or restaurants. But if you prefer international food it gets a little more expensive, although still affordable compared to prices back home. The most cost efficient way to shop is to go to the local daily markets. You’ll find them in every town the produce usually comes from nearby farms, so you’re not only getting the freshest food, you’re also helping to support the local community. There are international grocery stores throughout Bali, naturally imported goods are more expensive, but many people are happy to splash out on the few products they might miss from back home. You’ll find all the fruit, vegetables, eggs, meat and fish at the local markets and a trip to the grocery store for other basics like coffee, milk and cheese will stock the cupboards nicely. Buying a car can be rather expensive in Bali, so most people hop in a taxi or use scooters to get around. The benefit of having a scooter is that when it’s high season and the traffic is bad, you can zip past all the cars to the front of the line. If you are planning to move to Bali, it makes good sense to buy a scooter than to rent one, it’s more economical. However, until you find your perfect set of wheels, you can rent one daily for about $5-10, depending on where you live. Gas for scooters is often found for sale in front of someone’s little corner shop, or toko, and is sold out of old water or vodka bottles. Just pull up, ask for 1 or 2 bottles ($1) and they’ll pour it right in for you. 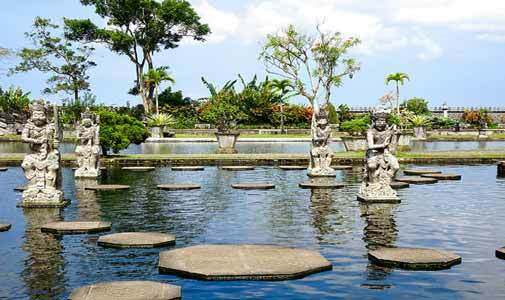 When it comes to choosing a place to settle down, Bali has lots of options to suit all budgets. Seminyak and Ubud are the most touristy towns, but they also have the most amenities and are very close to the best hospitals on the island, Siloam and BIMC. As a result, renting a villa in Seminyak or Ubud will cost more than in places like Sanur or Uluwatu. Lovina, on the northern coast, is the least expensive place to live that still has most of the western amenities you might want. A two-bedroom, two-bathroom pool villa in Ubud might cost $1,000, but the same in Lovina might be $400. A lot depends on the location you chose and how close you are to the heart of a city or a beach. No matter where you decide to live, negotiate your rent. The longer the rental, the lower the rate will be but as with anything in Bali, drive a hard bargain and you’ll reap the rewards.